Arabic is written using an alphabet just like English! There are 28 letters in the Arabic alphabet. Just like English, each letter represents a different sound used in the language. Unlike English, Arabic is read from right to left, and it is always written in “cursive,” meaning the letters always connect within words. Arabic isn’t just one language. There are three basic types of Arabic: Modern Standard Arabic (MSA), Qur’anic Arabic, and Colloquial Arabic. MSA and Qur’anic Arabic are the same no matter where you go. That’s why it’s called Modern Standard Arabic. Qur’anic Arabic does not vary either because it is the language used in the Holy Qur’an, and this text never changes. Colloquial Arabic, on the other hand, varies drastically from place to place. Each country has its own version of Colloquial Arabic, but dialects can be extremely different between regions or even cities. Written Arabic Usually Does Not Include Vowels. Arabic has six vowels – three short vowels and their three long equivalents. Usually, only consonants and long vowels are written in Arabic, as the long vowels are three of the 28 letters of the alphabet. Short vowels are represented by small diacritics (markings) above or below the letters that precede them. Short vowels are usually only written in texts for second-language-learners and children, and are always included in the Qur’an. Arabic is Not Only Spoken in the Middle East! Millions of people across every continent speak Arabic. Many of these people are either members of the Arabic Diaspora or are Muslims who learned the language in order to read the Holy Qur’an in its original language. Arabic is in the Family of Semitic Languages. The Semitic Language family includes languages like Arabic, Hebrew, and Amharic. This family of languages originated in the Middle East and its members share many features and words. Roots are Extremely Important in Arabic. running (currently traveling quickly on foot). Instead of this type of morphology, Semitic languages take a root and modify it using different vowels and syllable structures. Have you learned a language with a different alphabet? What is the hardest thing about it? Join the conversation in the comments below! The hardest thing about learning a language with a different alphabet is that if you do not learn something every day. after a week you have forgotten the alphabet and must learn the letters again. Painful! Spanish also. There are 4 main regions for Arabic dialects. Gulf/Iraq, Lavent, Egypt, North West Africa. The 4 regions are very different from each other and each are affected by local and neighbouring languages (Amazigh/Nubian/Aramaic/French/English/Italian/Spanish/etc..) The other way around can be noticed in languages like Maltese (Malta) where the language is around 30% Arabic + Italian. Interestingly enough, the same six points are true for Hebrew. Very interesting, you’re completely right! Although sadly I am not a speaker of either of your languages yet, Arabic is one of the languages I intend to learn. As a teacher of German and English (both as a foreign language) I am fascinated by the link between Arabic and Hebrew you mentioned as it proves how history impacts on linguistics. Part of my personal teaching concept is to find either commonalities or false friends between two languages to assist in the learning process. . I will no doubt have fun beginning to learn Arabic this year. I learned Russian and the Russian alphabet when I was 14 years old. I was so excited about it that I practiced all the time and drew charts with the alphabet with special ink. It thought it was beautiful. – I believe the reason for loving the Russian language so much was that as a child I saw my father taking Russian lessons on TV. He taught me a couple of words and I was so proud. I will always remember what a “glass of milk” is in Russian. I also liked the flow of Russian handwriting. 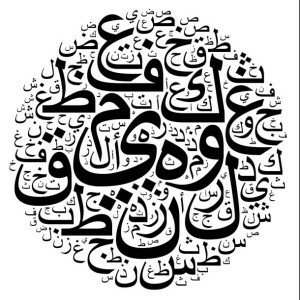 Arabic looks very beautiful too. Anything in Arabic looks like painted poetry to me. I would love to learn it. I learned the Arabic script at about the same age. I thought it was beautiful and just wanted to be able to write in it. I also learned the Russian alphabet last year and loved writing in it. Sadly, I have already forgotten! I love studying languages and learning about other cultures, so this is very interesting! I also agree with someone’s comment above, as languages are definitely impacted by the history and the culture of a region. We also need to keep in mind that language varies with time, so the way that people speak the same language may vary depending on when that language was taught. Language also evolves, so it might be influenced by other languages based on location and territorial conquests. Thank you for your input! I agree, culture and language are so interconnected, it is impossible to learn a language without also learning about the culture. I feel this is very true for Arabic. Islam and the ancient history of the Middle East are so ingrained in the language. A very informative post.Many thanks.I am sure you agree that all world languages have undergone varying degrees of change throughout history but some have been more affected than others because of the change phenomenon. Many variables come into play when it comes to this phenomenon, like how often the language is spoken , by how many and for what purpose……. But why is it that we hear the term : Modern Standard Arabic more than we hear Modern Standard French or Modern Standard English although Shakespearian English is a lot different from the BBC one for instance.Montesquieu,Diderot and Voltaire wrote in a much different French than what is we are exposed to as listeners in L” emission : Envoye’ Special……..I believe Arabic should just be called Arabic………………One typical feature of Classic /Literary Arabic which pertains to Grammar and that is non existent either in English or French is the singular, the dual and the plural pronouns for Mukhatib: المخاطب : addressee and Ghaeb: الغاڈب and which are different for masculine and feminine. Notice that although dual addressee and dual third person for both genders is spelled and pronounced he same the conjugation is different and can be clearly seen from the inflection.The personal pronoun you is repeated five times for the English language in the table above and while its equivalent vous in French is repeated four times In Arabic, however only antuma is repeated once and so is yuma but as was mentioned above the verb inflection in all tenses is different in all tenses for feminine and masculine. This is only meant to be a contribution for the sake of idea exchange and discussion and is not meant in any way to indicate that Arabic is hard to learn.In fact , in all Arab dialects spoken in different parts of the Arab world what is called in Arabic Spoken dialects or in some parts of North Africa: lahajat Al3amma للاهجات ا لعامت the plural tends to be used for both dual and plural. Besides, if the learner is intrinsically motivated what is perceived as difficult by some might be thought of as a pleasurable challenge by others. There is no verb for the European verb “to have” in Arabic. The main reason for it that we don’t have anything in this world. The God is owner of everything and we just use things and goods while we are alive.